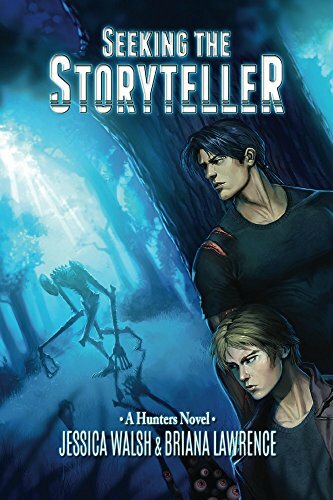 Wendy reviews Seeking The Storyteller (Hunters Book 1) by Jessica Walsh and Briana Lawrence. Published August 23, 2015, 332 pages. Why I read this book: This was the book that won the Readers Choice Poll. Thanks for voting, that was a fun event! I knew that any of the books that were in the poll were going to be good ones, so I was happy to jump right into this one. Once again, I was a bit intimidated just because this was a Sci-fi and for some reason I have it in my head that they are always going to be “over my head” and “out of my league”. I’ve only just recently started to read Sci-fi and I find that I really enjoy the worlds that these very talented authors create. I do find that there is always a LOT of information and this book was no different in that. So I found that the best piece of advice I can give myself is… in order to do these books justice, I need to take the time to give them my undivided attention so I don’t get lost down a rabbit hole. This was a fantastic world with some “Demons” (the creatures that inhabit another relm who sometimes sneek through a doorway to earth) that were kind of familiar and humanoid to completely unique to this book. I got a real kick out of the fact that there are hunters who keep our world safe and that they don’t just indiscriminately kill any demon that they run across. The two MC’s in this story end up joining forces with a rag-tag bunch of demons to try to find out who killed their friend and fellow hunter. The main thing that I got out of this story was that EVERYONE had their own agenda and while they worked together, they didn’t necessarily want the same things. Like the fact that Alix wanted to find the “Storyteller” and bring his family back. The other thing is that so many of these characters were not what they seemed to be. Kept me on my toes! To me, there was a touch of mystic where we all have our own stories (in actual books) that can be read. I found myself imagining an endless room of books with everyone that ever was or ever will be and from any relm that you can read. The characters were wonderful and spanned everything from sweet and naively innocent to evil master manipulators and they were all well developed. This book was very well written and I highly recommend it. I see that there is a book 2 available and I’m going to read it as soon as I can. Thank you all so much for choosing this book for me to read. I hope you all enjoy it as much as I did.